Far from being a monolingual, static society, ancient Egypt was rich in indigenous and imported languages and their scripts. 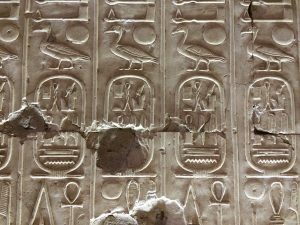 When we think of the language of ancient Egypt, the first thing that springs to mind is hieroglyphs carved on temple and tomb walls, the expression of a monolithic and unchangeable culture. Yet this could not be further from the truth. The civilization of ancient Egypt was much more dynamic and open to innovation than we normally give it credit for, and so was its linguistic complexity. Ancient Egyptian has one of the longest histories of written attestation of all world languages. First recorded around 3200 B.C., it gradually disappeared in the Middle Ages under the pressure of Arabic—a language that is not linguistically related to ancient Egyptian and is today Egypt’s national language. When we think of the changes that occurred in the English language between the time of Shakespeare and today, over a period of just four centuries, it is easy to imagine what dramatic transformations ancient Egyptian underwent over its own history, spanning four millennia. Old Egyptian—attested in the third millennium B.C. Late Egyptian—in use in the second half of the second millennium and the first half of the first millennium B.C. Demotic—attested from the seventh century B.C. to fifth century A.D. 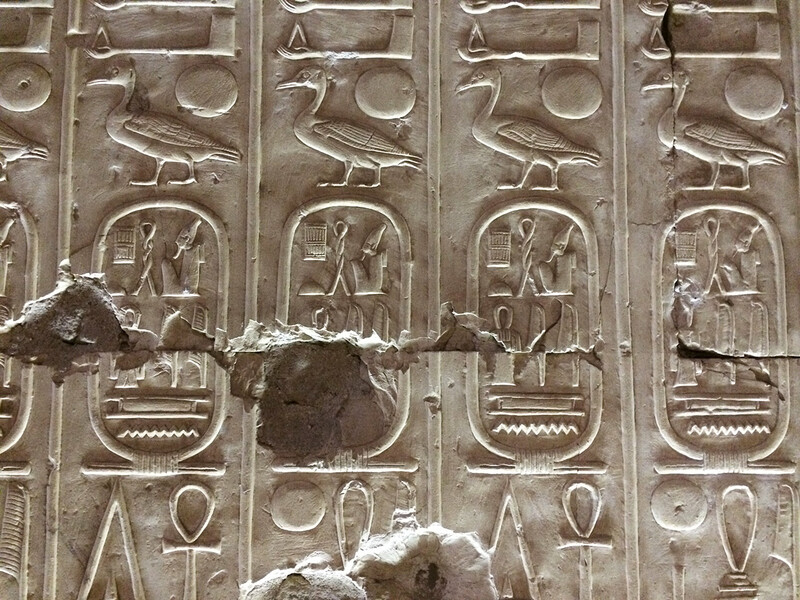 This all makes for a rather complex linguistic landscape, especially when we consider that, in the latter phases of ancient Egyptian history, several of the aforementioned language phases and scripts were in use at the same time. Nor was Egypt unaccustomed to foreign languages. In the exhibition Beyond the Nile: Egypt and the Classical World (March 27–September 9, 2018), the visitor has the opportunity to observe a number of written artifacts illustrating the outcome of language contact between Egypt and peoples from the Aegean and Roman world. 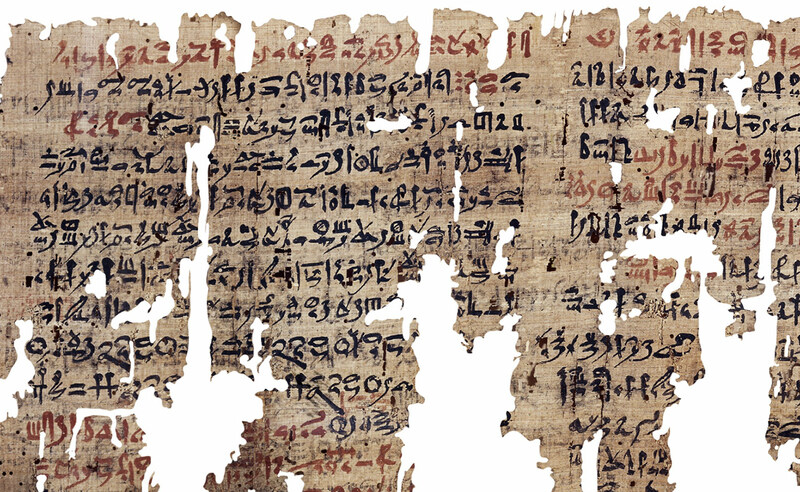 The so-called London Medical Papyrus is a manuscript dating from Egypt’s Eighteenth Dynasty, about 1400 to 1300 B.C. It contains a collection of remedies—consisting of both medical recipes and magical spells—for the treatment of various conditions, including swelling, skin diseases, eye ailments, bleeding, and burns. The text is written in hieratic (script) and composed in Middle Egyptian (language) but, remarkably, a number of healing spells in the section concerned with dermatology are not in Egyptian. As the papyrus itself points out, they are in fact in djed en khastyw, that is, “foreign language,” here transliterated in hieratic. One of the foreign languages used in this section of the text is that of Keftw, the ancient Egyptian name for the island of Crete. Throughout human history, societies ancient and modern have been fascinated with the culture of faraway lands—often perceived as a “secret knowledge.” The ancient Egyptians were no exception, and it is thus not surprising that they should have chosen a foreign language as a special linguistic vehicle for magical incantations. The presence of Cretan, the language of the Minoan civilization, in this papyrus shows that the links between pharaonic Egypt and the Aegean area in pre-Hellenic times went much further than trade or the visual arts would suggest (as witnessed in the Minoan-style frescoes of Avaris, in the Egyptian Delta), and that they also included intellectual and linguistic exchanges. 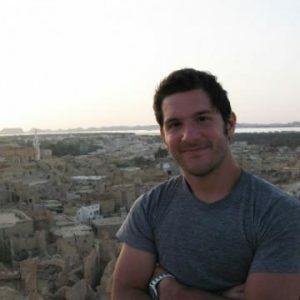 Moving eight centuries forward, to Egypt’s Late Period and its Twenty-sixth Dynasty (664–525 B.C. ), the presence of an increasing number of people from the Aegean world in Egypt, and especially in its Delta and in the area of the ancient capital of Memphis, was then a fait accompli. Arriving mainly for commercial and military reasons (many served as mercenaries in the Egyptian army), these communities included both Greek and non-Hellenic peoples, such as the Carians, from southwest modern-day Turkey. The funerary stela here pictured records the burial of a Carian woman named Píabrm, pictured in the bottom register, lying on a funerary bed. Yet the making of her stela, and especially the reliefs in the other registers, reveals how these Carian immigrants adapted themselves to the customs and beliefs of their new country while also retaining their own traditions and language. 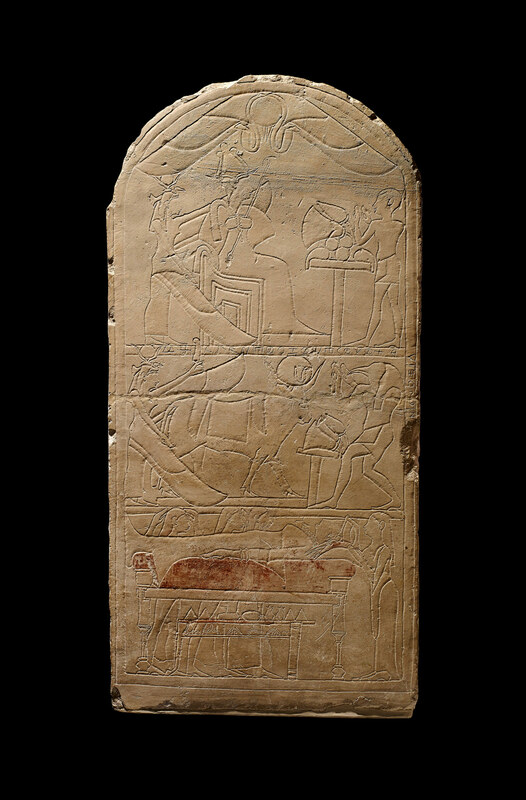 The top and middle registers sport deities from the Egyptian pantheon such as Osiris, Thoth, and the Apis Bull (a sacred bull worshipped in Saqqara, the same site where this stela was unearthed), while the scene at the bottom is remarkably un-Egyptian, showing the deceased Píabrm on a Grecian-style bier and the people around her performing Carian ceremonies. Note the second mourner from the left, who is lifting a knife to her forehead—a Carian mourning ritual of self-harm attested also in other sources. 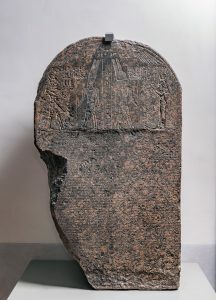 When it comes to language, the stela is wholly Carian: the text carved on it, recording the name and other information about the deceased, is not written in Egyptian hieroglyphs—as one would perhaps expect on a funerary stela from Egypt showing Egyptian deities—but in the deceased’s original language and writing, the Carian alphabet. It was finally with the conquest of the country by Alexander the Great in the year 332 B.C. and with the subsequent Ptolemaic Period (ending with the Roman conquest in 30 B.C.) that Egypt became a proper multicultural and multilingual country at all levels of society and in virtually all corners of the country. A new line of rulers took over the throne of Egypt—the Ptolemies—and, as these rulers originated from Greece, Greek became one of Egypt’s official languages, alongside Egypt’s old indigenous languages and scripts. No better artefact on display in the exhibition at the Getty could exemplify this than the stela of Kallimachos. This granite stela was originally set up in the temple of Amun at Karnak in the year 39 B.C. during the reign of the last Ptolemaic ruler, queen Cleopatra VII. It contains a decree issued by the local priests to honor a general named Kallimachos, who is praised in the text as a powerful local benefactor. Already at first sight, one notices some irregularities in this stela: this is due to the fact that the priests of Karnak were clearly working on a budget and had to reuse an earlier monument from the Pharaonic Period. 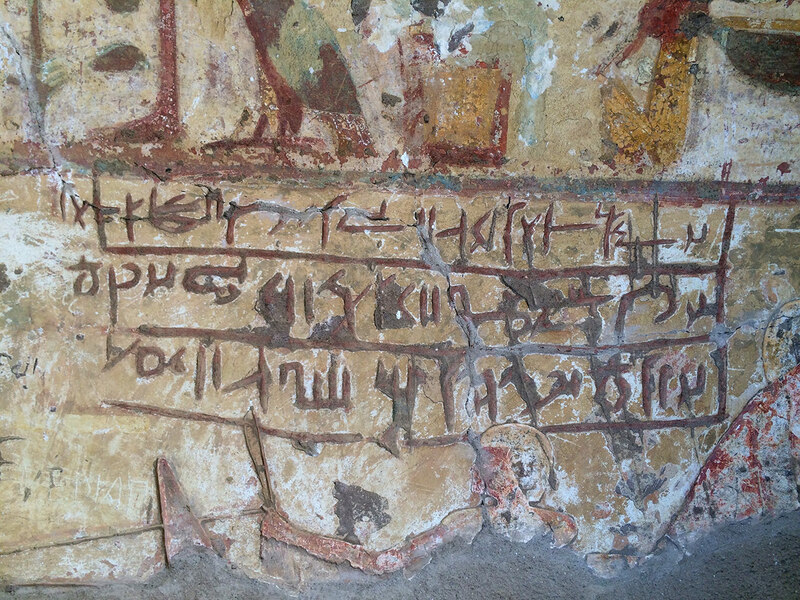 Most of its original hieroglyphic text and scene were erased. Only the images of the winged sun-disc and of the two gods (Amun-Re and Montu) with related hieroglyphic captions were preserved in the center. The Ptolemaic sculptors then added two new images to the sides, those of the ruler Cleopatra and of her heir Caesarion (her son by Julius Caesar), along with the hieroglyphic captions identifying them. The lower two thirds of the stela were covered with the decree itself written in “both Greek and native letters,” as the stela itself proclaims—that is, presented bilingually, in both Demotic and Greek, so as to cater to both possible audiences. Hieroglyphs (to write Middle Egyptian), Demotic, and Greek are all present side-by-side on this one monument, reflecting on stone the composite identity and the cultural traditions of Hellenistic Egypt. Egypt was not the only laboratory for such interactions and experimentations in the multilingual world of the Hellenistic and Roman Mediterranean. 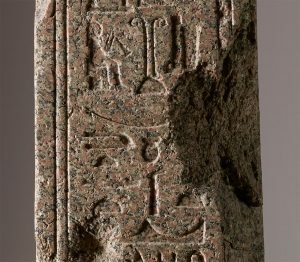 Artifacts inscribed in Egyptian also made their way to the four corners of the Roman Empire, and none are more remarkable than Egyptian obelisks. The obelisk of Benevento is paradigmatic in this respect. It was erected in the year 88 or 89 A.D. in the southern Italian city of Benevento to celebrate the Emperor Domitian and the Egyptian goddess Isis, whose local temple it decorated, along with a twin obelisk. 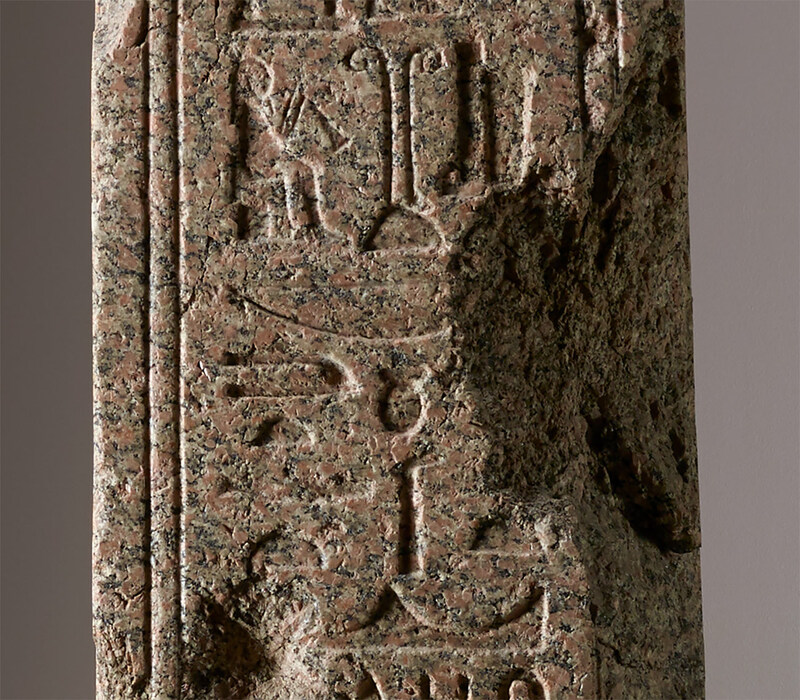 Even more remarkable than the obelisk per se are the inscriptions on its four sides, which must have been commissioned to a member of the Egyptian priesthood well-versed in the ancient language (Middle Egyptian) and script (hieroglyphs) of his native culture. A city of which the ancient Egyptians would never have heard thus received a rendering of its name in the most sacred and ancient language and script of ancient Egypt. 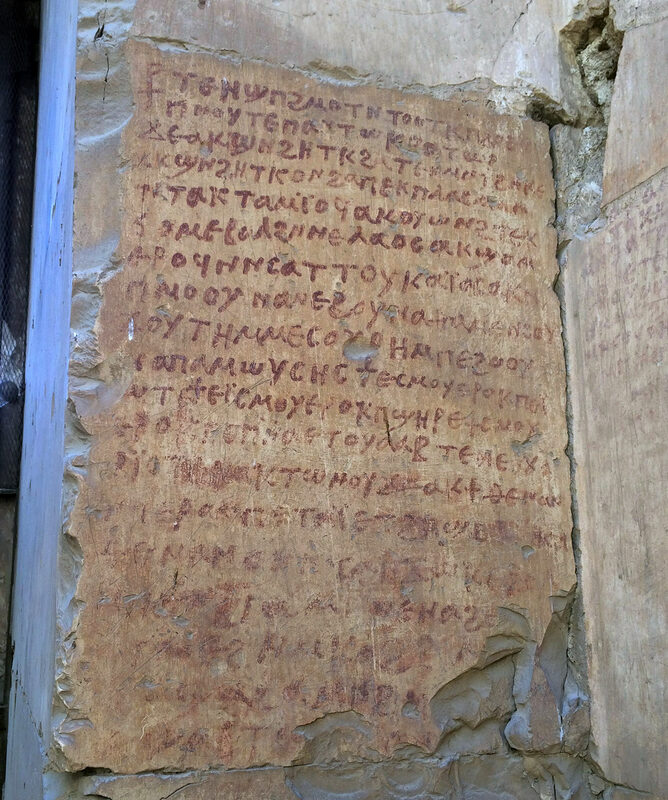 This would have probably bemused the Latin-speaking inhabitants of Benevento themselves, had they been able to read the inscription—perhaps not much unlike the experience of modern residents of New York, when they see the name of their city rendered into Latin, in scholarly publications or Roman Catholic Church texts, as Novum Eboracum. 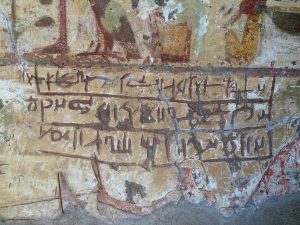 This entry was posted in Ancient, Art History, Egypt, History, Language, Linguistics. Bookmark the permalink.